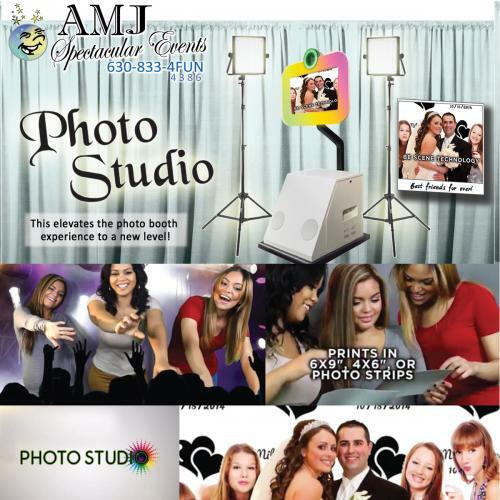 Your guests won�t need their selfie sticks with this interactive photo studio from AMJSE! Your guests will be able to capture their favorite memories from your event, strike a pose, or make silly faces with this perfect addition to your party! By using state-of-the art �green screen� technology, your guests will be delighted with a truly interactive photo experience with endless possibilities! Some of the features included in our Photo Studio Interactive are customizable step�and�repeat backgrounds, standard photo booth shots, �Be Scene�, which lets your guest appear �inside� the photo booth with each participant, and interactive �Fun Scenes� that take themed interactive shots. Each of these options are prompted by unique videos and �photographers�. Your guests will be able to customize their photo session by choosing from different print size options or share their creations on social media platforms such as Facebook and Twitter. Add your company�s logo with our custom logo options! Let AMJSE take care of all the work - we will deliver, set-up, and take down your Photo Studio Interactive, so all you have to do is enjoy! Contact us now to talk about this, other fun games, or about the hundreds of other rentals we have ready to help make your party a spectacular event! With revolutionary new features, such as customizable step - and - repeat backgrounds or "Be Scene", which lets your guest appear "inside" the photo booth, the Photo Studio is a game changer! Don't forget, every time you enter the Photo Studio, A New Experience Awaits. This elevates the photo booth experience to a new level! The AMJ Interactive Photo Studio using state-of-the-art "Green Screen" technology to deliver high-definition photos, there are endless exciting opportunities!